Voice is little regarded in the film business, either by actors or directors. Sets are dry, smoky, unhealthy places. Unlike theatre, many actors don’t see the need to warm up or cool down for screen. Directors hope to ‘fix it in post’. Yet voice is vital for an actor’s screen presence. Once, sound was king. Why is voice now so neglected in screen work? And what can we do? Movie sets and locations are unhealthy places. Cinematographers have always liked haze to show off their subtle lighting effects, but since the advent of HD digital cameras, everyone expects all flaws to be softened. Now, almost every set has some form of smoke: everything from vegetable based haze (to which some people become allergic) to full-on smoke. I recently worked on a Pinewood franchise in Asia, which had no extractor fans, where real fires on set sent smoke into the whole stage area. The crew used masks, which helped a little, but the actors could not. The filming went on day after day for five months. Some years ago I worked on a five-month film that was shot in Ireland but ignored every EU clean air rule. Tyres were burned on our location to provide the thick black smoke that the director needed. The actors (happily) refused to ride through the smoke eventually, but the doubles and extras continued to do so. When I drove back to Dublin to catch my weekend plane home, I could see all the way, in my rear view mirror, the black column of smoke rising from the Wicklow mountains behind me. Film studios are either cold and dry or hot and very dry. Locations may be in a Moroccan desert sandstorm, or on a night shoot in freezing conditions on the slopes of a burned–out volcano in Hungary. Fake snow is the worst; the paper dust goes into your lungs – but at least they don’t use asbestos any more. Big budget films used to have a studio nurse in attendance ready to hand out hydration aids, but I haven’t seen one on the mammoth television series that are now the mainstay of an actor’s work. Hydration and vocal health considerations are left entirely to the actors – many of whom are unaware of the hazards; how to solve or, at least, mitigate them; or how to get help. I’ve worked on several projects where filming on the lead actor has had to be postponed for several days because of voice strain. Actors don’t expect, or prepare, to project their voices. And they decline assistance – until they find themselves in trouble after filming on a full size battle field, yelling orders at their troops. (I hasten to add that, if on set, I offer help in the aftermath.) I also believe that there is a new tendency to decline technical help because of a misplaced belief in authenticity and the need to suffer for the sake of verisimilitude in art. Albeit that in life, a general would have learnt how to project without voice loss! Drama is emotional stuff. Actors are asked to cry, and cry, and cry. They must throw-up, scream and use all kinds of extreme vocal work. Unlike theatre, there is no time-lapse between repetitions of the behaviour. The bigger the budget, the more set-ups and takes there will be. Actors always give it their all – there is no ‘marking-it’ as there is little or no rehearsal for screen. It is all performance. I stood up to a director on one occasion when seven takes had been done of the vomiting scene. I explained that the actor would have no voice for the next week, and was able to take them away for steam, voice rest – and a gentle warm up the following day. But few films have voice coaches present – so we need emancipated actors. They need to take control of their voices and understand that sometimes they may need to speak to the director in order to protect their vocal health. We need to make actors aware that warming up and cooling down is vital for screen work too. Maybe it is more vital because on stage, the art of projecting the voice night after night means that actors learn how to have good posture and alignment, use abdominal-diaphragmatic breathing and ergonomic use of their vocal folds. Film is a terrible trap. It is not stage where vocal ‘support’ is part of technique. It is not life when we are relaxed. Actors are fighting lions over and over again with each take. There is nothing more terrifying than hearing, ‘Quiet everyone, going for a take’. ‘Sound?’ ‘Sound speed.’ ‘Camera?’ Camera speed.’ ‘Action!’ Then the whole crew go quiet and look at the actor. No wonder nervous, often untrained, actors lean forward, collapse at the chest, raise their shoulders or stick out their chins to protect themselves. No wonder they get into high, clavicular breathing, creak or go breathy and disconnect from vital muscles. And this whole thing is repeated time and again – set-up after set-up, take-after-take, six days a week for months on end. In theatre, an actor stands quaking in the wings, taking courage to jump into the metaphorical freezing lake before them, then plunges into the water – swims to the end of the play (with a little rest in the interval) then shakes dry, (hopefully cools down vocally) and goes to the bar. On a set, the actor has to keep going in and out of that cold water all day. Scenes are out of order, so there is no sense of swimming through the piece in a satisfying, tension relieving manner. In some shots, there may be a lack of physical freedom because the actor is in extreme close-up or working with blue or green screen where movements need to be exact for the subsequent computer generated images – or even worse, the 3D version. They may be hampered by heavy costumes or corsets; boiling hot or freezing cold. The noise of planes and traffic, the director’s love of the ‘wind machine’ that sounds like a helicopter are legitimate reasons for ADR, or looping. But an actor using an inappropriate volume is not. And I also see, as a voice and acting coach, that you can’t really ‘fix it in post’ if the actor’s body wasn’t engaged in the first place. The actor has to use the appropriate vocal energy while filming for the picture in order for the body and the voice to match. It isn’t possible to hold back, hoping to put the full sound on later. Yes, the actor may be wearing a hidden throat mic, but they can’t use less than the full energy they would use in life, if they are commanding their troops or screaming at their lover. Yet many actors tell me not to care as they will ‘loop’ it later. There is another fundamental difference between theatre and screen. There is no audience when actors are being filmed. In live performance, an actor does indeed communicate with the other actors sharing the stage, but also communicates, either at a deep level or overtly, with the audience. On film it is all too easy to communicate with no one. Their is seldom any group rehearsal with a chance to work with the other actors or build up relationships or trust. The actor may be in close-up with no other actor in their sightline, and no in-built drive to reach an audience. Of course, they are right to be only in their imaginary world, without an audience. But within that world, when they need to speak, it is to communicate something to someone! We’ve all heard that on screen ‘less is more’ but that can’t be true. There may be less ‘acting’ or ‘showing’ or audience – but it can’t be less than life. And life on film can be pretty extreme. Yes – the camera can see you think – but once that thought leads you to need to speak to someone, you have to be heard. You speak to change another character or the situation in some way; to get what you want; or to offer something. Yet what I notice most is how, when an actor is on learned lines, the energy drops. Ends of words tail away. And so do many viewers. There has been much talk recently about the inability of television viewers to understand the dialogue. To be fair, some of the problems are associated with the poor quality of speakers in flat screen televisions (they need a sound bar) but by no means all! Many actors have a habit of talking to themselves, rather than to the other roles – they are not really communicating with each other, or using anything like the vocal energy that they use in life. 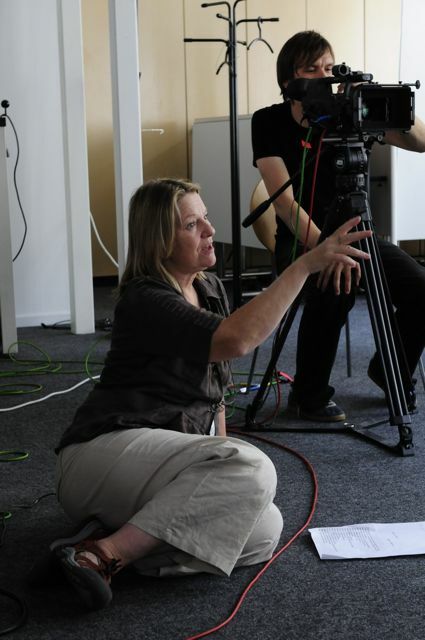 In workshops, I begin by filming the actors telling a real story of an experience they’ve had to another actor sitting by the camera – their story of bungee jumping, cooking a meal, losing the way – before they embark on a learnt ‘monologue’. On playback, we compare the voice they use to tell the real story with the voice they use when speaking text. In the former, they generally have so much more energy and ‘connection’, because they have a need to get the listener to share the pictures they have in their heads, and to understand the experience they went through in specific detail. I find it difficult to separate voice work and acting work, because finding the real drive behind the words of the monologue changes the energy and quality of the voice. We underestimate how unnatural learnt text is. In our own lives rarely do we have prescribed words to say. (Except maybe in court, or at a marriage ceremony.) The difference between hearing real speech and learned lines can be striking. The energy is generally much lower on text. Often actors let their breath out before speaking with learned responses. So many actors do it. It is a way to calm themselves and put off the moment of speaking words that aren’t their own. To give themselves one more second. But they forget to allow the breath back in before they speak. Whereas in life, the thought and simultaneous intake of breath lead directly to speech, actors often ‘miss the moment’ so that there is no energy in the voice, and the actor registers the discomfort of not feeling ‘real’. We all do it sometimes when depressed, or if we think better of what we are going to say, but not usually during normal, connected speech. If actors need to release the breath to re-find relaxed breathing (or do any warm-up) best to do this preparation before ‘Action’. Equally they should resist taking in a ‘locking’ preparatory breath. My advice to them at the start of a take is to remember where they’ve come from or what they want, or look around the real or imaginary world to find something that triggers the need to speak. As the impulse rises – simply ‘go’. Like life. I worked in theatre for many decades and spent twelve years in charge of voice and text work in one of London’s most difficult spaces, Regent’s Park Open Air Theatre. (I believe they use microphones there now.) I went from the telescope to the microscope, as it were. And I am always amazed when I ask trained actors who are used to working in theatre whether they warm up and cool down for screen. Most say ‘No’. A very few say ‘Yes’ to warming up, but nobody seems to know about cooling down afterwards. When it comes to warming up the vocal apparatus, I always ask, ‘What wouldn’t you need?’ You need the same posture, the same open channel to your vocal and emotional centre. You are fighting lions all day and need relaxed breathing; you are working long hours under difficult conditions; you are repeating short amounts of text over and over again; you may have jet lag and too little sleep – and yet great film actors, like great theatre actors need grounded, flexible, memorable voices. OK, maybe you won’t need any more projection than in life (although you may), but this is not life. It is a highly artificial experience, and the most unnatural aspect of all is speaking learnt lines. We never do that in life. And you do this in front of a camera and crew, that you must ignore, and with no rehearsal. I assume not many voice practitioners would recommend a routine of getting up at 4 a.m., sitting in make-up for three hours, going out onto a freezing location or smoky set at 8 a.m. eating junk food for a short lunch break, completing a fourteen-hour day (including travelling) by going to the bar for a quick drink, then falling into a fitful five-hour sleep. Then repeat six days a week for five months, remembering to go to the gym for training, or do publicity on any days off. That is the schedule of a leading film actor. I doubt critics would wax as lyrical about many modern actor’s voices – especially on screen. Voice and acting coaches are rarely used on film. No one wants to spend money on anyone not vital to the production. So we turn up only for accents, very special projects (I’ve worked with ancient languages and one script where only words with Germanic roots, rather than French, were used), when the actors’ roles are real-life people (where you are looking at physical and vocal rhythms, tics and gestures) or with young or untrained people. A lot of the actors I help on set have come from somewhere else and haven’t trained conventionally, or trained at all – they are models, singers, dancers, sportspeople, young people. They have never done vocal work and time on set is short. Of course I work in many different ways with the dialogue with my ‘acting coach’ hat on, but I always find time to do basic voice and breathing work. I usually have very little time to work with people – and, as they are rarely trained, no shorthand. I have become a ‘quick-fix’ merchant. I use a very simplified version of ‘Accent Breathing’ to take them out of clavicular breathing and into the abdominal-diaphragmatic area. This enables quick recoil so that breath is not drawn in with tension, aids relaxation and emotional connections, as well as helping to produce a warm ‘centred’ tone: what I hear as ‘the ring of truth’. If an actor is not breathing, they are not able to listen. And if they are not listening, they won’t be fully interacting with the other roles. And it will show. If the breath isn’t flowing, they will have no emotional connection and will start to ‘push’ and manufacture emotion. And it will show. The solar plexus area is the greatest meeting point of sympathetic and para-sympathetic nerve endings. It is where we ‘feel’ emotion. Just keeping a hand on the stomach – out of shot – can help with feeling ‘connected’ emotionally and vocally, and take tension off the face. It helps with studio microphone work too. If they have to be strong emotionally or vocally, I use simple exercises such as pressing against a wall (engaging the abdominal-diaphragmatic area), coming away slowly, and keeping the sense of ‘power’ within them. As an acting coach, I tend to work through muscle memory and improvisations that put ‘pictures’ into their minds, aid specificity and focus the drives of the piece. I use all kinds of physical metaphors, such as floating or flying or pressing – or psychological gestures or hidden animals – and these also affect vocal delivery and connection to the role and the text – as well as allowing emotion to arise unbidden. The stronger the belief in the world – the safer they feel. And the safer they feel – the less tension they will hold. I use a simple way to ensure the false vocal folds are not held across, thus making the voice ‘creak’ – by asking the actor to hold their hands over their ears, to consciously hear the breath coming in and going out, then to make it silent. Creak is the ‘folded arms of the voice’: the way an actor protects themselves because of shyness, fear or cutting off emotions. Of course it can also be a learnt posture, and the role may choose to use this voice in some situations. But the actors themselves need to be in an open, free, released state, so that any use of constriction such as ‘creak’ is a temporary choice, never a default position. With regard to cool down – I ask actors whether they stretch after jogging. When they confirm that they do, I remind them of the hard work the vocal folds are doing and teach them to ‘siren’, or hum to stretch them out at the end of a long day. I talk about staying hydrated and using steam if in any discomfort. Of course, if I am lucky enough to have time in the pre-shoot period, I will use a much greater toolbox of vocal work, and address any specific vocal, communication or – if appropriate – acting issues. These days, films are funded by money from many countries. For the rise of ‘box-set’ series, casting directors comb the earth for actors who will ultimately use English as their working language. For a few of these, English will not even be their second language but their third or fourth. I once worked with a marvellous Italian actor who didn’t speak English at all and had to learn his twelve pages phonetically. He also had to learn those twelve pages three times because the script kept changing. Incidentally, his part was the only original sound left in the film without ADR (looping) because his scene was in an interior, and the rest of the film was filmed against a wind machine. I often work with second language speakers. I am sometimes moving them towards a particular accent, but usually I am working simply for clarity. I always urge them to move between their first language and the new one when rehearsing so that the English (or any second language) sinks, as it were, and the actor is working physically and emotionally from the same area. I am talking about the abdominal-diaphragmatic area, rather than the laryngeal posture, which will vary accent to accent and language to language. Returning to their own first language doesn’t seem to affect the pronunciation in the new one. It helps to find the logical sense and emotional drives. It is only when I work within accents of the same language that I urge them to stay in the new accent throughout the filming day. Another point that I notice is that, if English is not the actor’s first language, the tune will have a more ‘foreign’ feel when the actor is on text than when speaking as themselves. The constraint of the written text imposes more structure on the speaker than everyday speech. I find that whispering the lines (without voice) brings the actor back to the sense of what they are saying and allows the stress to fall in the right place. Although in their original language, the words may not be in the same order, the sense will be the same, and so they will re-find the thought. By the way – always ask the sound mixer for headphones on set. If you are working on clarity, it is worth shutting your eyes to listen when you are deciding if the speaker is easily understandable. It has been proved that the predictive brain will fool you into hearing clarity if the words are in front of you. There are some technical voice requirements for screen actors. Generally, they need only the same level of voice that they would use to communicate with the other person in real life. (Not less!) But because sound and picture are on separate ‘tracks’ for editing, the actors can only dance to the music until the final camera rehearsal, then they have to dance in silence for the ‘take’. This means the actor needs to keep a ‘soundscape’ in the head in order to keep the same level of voice as was used when the music was playing. Actors forget to allow for the music, steam trains, waterfalls, background noise in pubs – and so on, and they let the volume drop too low to be heard over the sound when it is re-inserted in post-production, or added in the Foley studio. This seems to be particularly hard for young, untrained actors, who drop level within a few moments. A failure to keep the vocal energy up makes the actors inevitably bound for that recording studio after filming is completed. Note that ‘wildtracks’, which are sound-only takes – arranged by the sound-mixer on set after the scene is shot, and the crew are moving to the next location, are important! Actors used not to care because they were solely for the editor’s benefit. Now they can be digitally manoeuvred to be used in the final film. Another technical filming tip is not to overlap dialogue when in close-up. When all the actors can be seen, with mouths in full view in the master-shot, overlapping is not a problem. But when it comes to close-ups, only the sound of the actor in full view in the picture will be used in the edit. If they overlap with their off – or nearly off-screen partner – it will be hard to edit, and post-production beckons. An ADR session lasts many hours or days, and can involve screams, groans, heavy breathing and even snoring, , as well as filmed dialogue and off-screen voice overs. And vocal coaches, even if on set, are rarely present at post-production – crazy as that seems. This is why accents slip in and out of finished films – the ‘out’ bit being the sections that were done in ADR months after the original filming. Every dialogue, dialect and voice coach on a film hopes, along with the sound-mixer, that the original sound will remain in the final cut of the film. Sadly, this is very rarely the case. Aeroplanes, cars, creaking leather costumes and so on mean the dialogue has to be replaced later. Thus, many screen actors pay little attention to their vocal delivery and many actually prefer to ‘fix it in post’. But a lack of vocal energy in the original performance will show in the body. And whether the dialogue is done on set or in a recording studio – nothing replaces the ‘ring of truth’ that is there in a naturally supported voice. A tense, creaky, or breathy delivery can never be given that quality by a post-production sound technician. This is why we need to encourage actors working on screen to train, warm up and cool down, and understand basic vocal health, hygiene and hydration. Then they will speak both with their eyes and their voices. Mel has two published books: Acting for Film: Truth 24 Times a Second (published by Virgin Books/Random House 2003) and A Screen Acting Workshop + DVD (published by Nick Hern Books 2011) and has written many articles on voice and acting. Thank you for the insight into this subject. As someone with very little experience in film sets, this has certainly made it crystal clear the importance of keeping the voice warmed up and hydrated. Thank you for sharing this invaluable resource.